A KMS cyclist leads a pack during a recent race, helping to start the season well. New team member Josh Chu, competing in his first criterium, showed that he has the strength, skill, and tactical prowess to make him a contender! Then it was Noah Barrow and Vivien Rindisbacher’s turn; they put on a teamwork clinic to bring home the first win of the road season for KMS Cycling in the Collegiate Mens A field, Coach Ramsay continued. In the end, it was Rindisbacher who outsprinted the field and was first across the line. However, Barrow and Rindisbacher alternated launching a number of attacks and counter-attacks, and blocking for each other throughout the race. Barrow finished just behind Rindisbacher (top ten). “It was impressive to watch!” said Coach Ramsay. On Sunday, the team took to a two mile circuit with one fast turn, and a climb to the finish. New team member Samantha McKinnon was caught in an early field split, but rode a great race in the Women’s B field. Turner, racing 15 laps with the A women, had an unfortunate crash in the first lap, but jumped back into the race behind the leaders and gave it her all. Josh Chu also turned in a solid race in the Men’s B field. Though caught in an early split, he drove the chase effort for the remainder of the race – an impressive ride! In the Men’s A field, the peloton let an early rider attack and go up the road. It was with only a few laps remaining that Vivien Rindisbacher decided it was time to bring him back. He and two others (one a teammate of the leader, who was unable to match Rindisbacher’s pace, and quickly dropped off) gave chase, but started just a tad late as they brought a 40 second lead down to just over 10. At the same time, the field decided it didn’t want to get left behind, and also ramped up the pace. Just catching Rindisbacher’s group in the final lap, Noah Barrow took advantage of the situation, and sprinted to a fourth place finish. 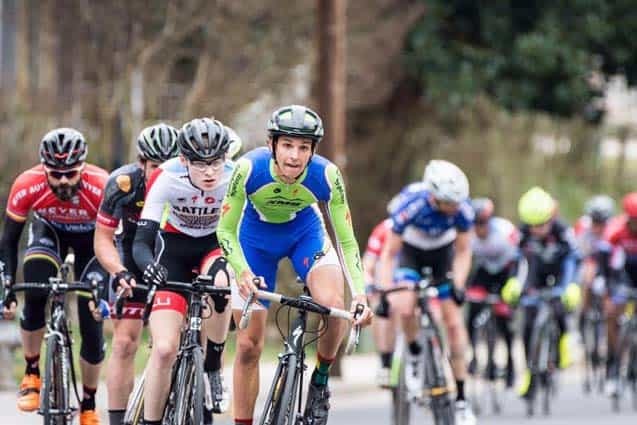 “It was a great weekend of racing and a good primer for the upcoming ECCC Collegiate Road Season, which begin next weekend down in Philadelphia,” said Coach Ramsey, referring to this past March 19-20 weekend.